West Windsor, N.J. - Students at Mercer County Community College will have increased options to visit and study in foreign countries during the 2010-11 academic year. "There is so much learning that goes on beyond the four walls of a classroom," says Associate Business Professor Andrea Lynch, who coordinates the Study Abroad initiative. "We have much to learn from other cultures." Mercer offers two paths for international education: a Semester Abroad and short-term faculty-led Study Tours. The Semester Abroad option enables students to travel on their own to colleges in Europe, South America or Asia for either a full semester, a winter session, or a summer session. Students may earn from 3 to 16 college credits that can be applied to the requirements for their course of study at Mercer. Housing options vary from home stays, to dorm and apartment settings. at Pompeii during their Italy trip in May. Students ages 18 and older may also enroll for Study Tours and travel as a group with MCCC faculty members and local tour guides in the destination country. Four trips are planned for spring and summer, 2011, and are open to community members, who may register as noncredit students through MCCC's Center for Continuing Studies. According to Lynch, the goal of the Study Tours is to take students outside the traditional classroom to experience a foreign culture on different levels and from different perspectives - its history, art, business, science, food and more. 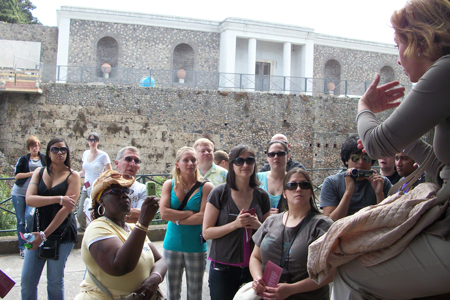 In May, Lynch and two other MCCC faculty members led a group of 23 students on a 10-day tour of Italy. "The lessons learned were both academic and social," she observes. "These students were in the moment. Education is all about engagement. That's where learning happens." The first tour destination is Costa Rica from March 11-18, 2011, for students enrolled in "Introduction to Sociology" and "Beginning Spanish II." The trip features home stays with local residents and tours to numerous sites including the National Cultural Museum, National Theatre, Central Cathedral, a zip-line tree canopy tour, and Volcano Poas, as well as a health clinic, senior center, farm, schools and soup kitchen. From May 23-June 1, students taking "History of Western Civilization," "Art and Culture," and "Architecture and Culture: International" will travel to London. Sites include the People's History Museum, Museum of Science and Industry, The Whitworth Art Gallery, Quarry Bank Mill, the Royal Society of Arts, National Maritime Museum, the Royal Observatory, Tate Modern, Hampton Court Palace of William III, Royal Society of London, Stonehenge, Avebury, Bath, Windsor Castle, and Cambridge. Next up is Germany and Switzerland from May 30-June 5, for students taking "Global Environment of Business." Trip highlights include the World Trade Organization, European Central Bank, Daimler and Mercedes Benz facilities, and the Frankfurt Stock Exchange, as well as picturesque stops at Lake Geneva, German castles, and the historic cities of Geneva, Heidelberg, and Stuttgart. The final destination is Paris from July 10-17. Students taking "Microbiological Science Concepts," "Microbiology," and "Food and Culture" will visit cheese and wine making facilities, and discover the scientific contributions of Louis Pasteur. The itinerary also includes the Eiffel Tower, Sainte Chapelle, Notre Dame, Paris Catacombs, Hotel des Invalides, Dome Church, Latin Quarter, Arc de Triomphe Ascent, Avenue des Champs-Élysées Walk, Jardin des Tuileries, and the Louvre, as well as a day trip to Burgundy. The college will host Information Sessions throughout the fall for students and community members. The first session will be held Wednesday, Aug. 25, 6-7 p.m., in CM 108, on the college's West Windsor campus, 1200 Old Trenton Road. Additional sessions will be held Sept. 21, Oct. 7, Oct. 20, Nov. 4, Nov. 29 and Dec. 7. For the full list of information session dates, times and locations, click here. More information is also available by e-mailing studyabroad@mccc.edu or calling (609) 570-3660. Applications are accepted on a first-come, first served basis. Depending on students' circumstances, financial aid awards may apply. Learn more about both Study Tours and Semester Abroad here.